After boarding your ship in New York City, enjoy a delightful afternoon cruising from the metropolitan area to the Hudson River region. In Catskill, visit the Clermont State Historic Site, home to Robert Livingston Jr., the first minister of foreign affairs who negotiated the Louisiana Purchase and helped draft the Declaration of Independence. You will also have the chance to visit Olana, home of artist Frederick Church. The picturesque region of what is today the city of Albany was discovered by Henry Hudson in 1609 on a failed attempt to find an expedited passage to China for the Dutch East India Company. Today, the capital city of New York welcomes visitors with majestic architecture and grand views of the beautiful Hudson River Valley. Be sure to explore the New York State Museum and the newly-renovated State Capitol building, originally built in the late 1800s. With the invention of the steamboat in 1807, the Hudson River became a waterway of leisurely travel with hundreds of vessels making their way up and down the picturesque passage. Kingston helps preserve the maritime heritage of the Hudson River at the Hudson River Maritime Museum. 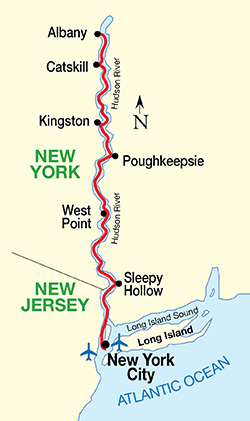 Kingston is also located in an area of the Hudson River often referred to as "Millionaires Row" - which is replete with palatial estates and grand mansions built by wealthy New York businessmen who bought the property for summer retreats. Spared from battle during the Revolutionary War, Poughkeepsie became the second capital of New York. Due to the area’s natural beauty and proximity to New York City, families such as the Astors and Vanderbilts built sprawling weekend homes nearby. Hyde Park, located just north, was the birthplace of U.S. President Franklin D. Roosevelt. His Springwood estate is now the site of the Home of Franklin D. Roosevelt National Historic Site. Steeped in history and tradition, the United States Military Academy at West Point offers visitors the opportunity to walk on the grounds once trekked by some of the nation's greatest generals, like Patton, Eisenhower and MacArthur. Founded in 1802 by an act of Congress, the Academy has been of significant military importance to America since Revolutionary days. Tour the West Point Museum and Cadet Chapel, while viewing magnificent vistas of the Hudson Valley from atop the campus grounds. The riverside town of Sleepy Hollow is forever immortalized in the works of one of the country's first great writers, Washington Irving. The author found inspiration in the Hudson Valley, creating legendary stories like Rip Van Winkle. Today, Irving's country home, Sunnyside, is a National Historic Landmark and welcomes visitors with tales of the man himself. Cap off your trip with a day in the Big Apple. Once you have docked in Manhattan, enjoy all of the offerings that New York City embodies. Take in cultural events at the Metropolitan Opera House, exhibits at the Museum of Modern Art or simply go sightseeing throughout this metropolitan wonderland. Surrounded by the Catskill Mountains on the western shore and the Taconic and Berkshire Hills to the east, the Hudson is rich in both history and beauty. The cities and towns along the way date back to Dutch and English rule, featuring some of the most magnificent architecture in America. Begin and end your voyage in the most exciting city in the world, New York City. Dock in Manhattan and experience renowned art and history museums, famous landmarks and a gorgeous cityscape.